Mitral valve stenosis (MS) can be congenital or acquired. Congenital MS is mainly the consequence of abnormalities of the subvalvular apparatus and occurs mainly in infants and children. The congenital causes include parachute mitral valve deformity, congenital MS, supravalvular mitral ring and cor-triatriatum. The acquired causes of MS include rheumatic heart disease, left atrial (LA) myxoma, mitral annular calcification and thrombus formation. Rheumatic MS is the most common form encountered in the developing world. The rheumatic disease process causes contracture, scarring, and diffuse thickening and fibrosis of the leaflet tissue, fusion and fibrosis of the commissures and the subvalvular apparatus, and calcium deposition within the leaflets. These processes result in a decrease in the effective mitral valve orifice area (MVA) and manifestation of clinical features of MS. The main mechanism of rheumatic MS is commissural fusion. Other lesions such as chordal shortening and fusion, leaflet thickening and its calcification contribute to the restriction of leaflet motion. Degenerative MS is frequently observed in the elderly individuals, which differs markedly from rheumatic MS; the main lesion in it being annular calcification. Isolated calcification of the mitral annulus has few or no hemodynamic consequences, and it more often causes mitral regurgitation than MS. In degenerative MS, commissural fusion is rare, and the valve thickening or calcification predominates at the base of the leaflets whereas in rheumatic MS, the tips are predominantly affected. Protruding calcification, reduction of normal mitral annular dilatation during diastole , and impaired anterior mitral leaflet mobility,  are possible mechanisms responsible for the increased mitral gradient caused by mitral annular calcification. Other rarely encountered causes of MS include inflammatory diseases (e.g. systemic lupus erythematous), infiltrative diseases, carcinoid heart disease, and drug-induced valve diseases. In these situations, leaflet thickening and restriction is the cause of stenosis, and the fusion of commissures is rare. Physiological increases in cardiac output to meet the demands of normal physical activity or excitement is achieved by increases in heart rate, myocardial contractility and venous return mediated by sympathetic stimulation. In a healthy individual, a modest (about 25%) increase in cardiac output results in ~ 40% increase in transmitral flow rate which is innocuous; however, in presence of severe MS, this increase in transmitral flow rate can cause a doubling of transmitral pressure gradient and marked elevation of pulmonary capillary pressure, which in some instances cause pulmonary edema. Over a period, MS and persistently raised LA pressure result in LA dilatation, pulmonary venous hypertension, reflex pulmonary arteriolar constriction, obliterative changes in pulmonary vascular bed, pulmonary artery hypertension (PAH), right ventricular hypertrophy  right ventricular dilatation, tricuspid valve dysfunction, systemic venous congestion, compromised LV filling, and a state of subnormal cardiac output,  which fails to increase during exercise. Increased LA pressure and volume overload results in structural changes in LA, which alter its electrophysiological properties. Additionally, the rheumatic process may lead to fibrosis of the internodal and interatrial tracts and damage to the sinoatrial node, these changes are believed to result in atrial fibrillation. Atrial fibrillation occurs in 30-40% patients with MS. The arterial blood pressure (ABP) is usually maintained within normal range by increases in systemic vascular resistance (SVR). Despite normal ABP, perfusion of various organs such as liver, kidney, etc., is often impaired that clinically manifests as increased serum creatinine, prothrombin time and icterus. At this stage, a mild decrease in SVR associated with the administration of sedatives and anesthetic agents can result in a precipitous hypotension. PAH in MS is considered a sequel of increased LA pressure, reflex protective pulmonary arteriolar constriction, intimal hyperplasia, medial hypertrophy, and pulmonary arteriolar obliteration. A close scrutiny of reasons of increased LA pressure is necessary to understand the genesis of PAH. The pressure in a relatively thin-walled chamber like LA depends on several factors such as its stiffness, mechanical effects of its rhythmic contraction and relaxation, diastolic period, the quantity of blood entering and exiting it, and the net atrio-ventricular compliance, which include compliance of LA and LV, and compliance of the pulmonary venous system. For the increase in LA pressure to be substantial that develops in severe MS, the compliance of LA and pulmonary venous system should be low else the effect of damming of blood will dissipate in LA and pulmonary vascular bed and a substantial increase in LA pressure will not occur. In a study of 20 patients, a subgroup of patients was found who responded to exercise by a significant increase in PA pressure, in that subgroup the net atrio-ventricular compliance was found significantly low. Apparently, in patients with MS, a wide spectrum of atrio-ventricular compliance exists-patients with low compliance and patients with normal compliance. Patients with low compliance develop severe PAH, severe increase in left atrial pressure (LAP) and symptoms of MS on exercise or in situations of increased cardiac output whereas patients with normal compliance remain asymptomatic in situations of increased cardiac output as the increased right ventricular (RV) stroke volume is accommodated in the compliant pulmonary venous bed. At least two more factors, the role of LV relaxation on diastolic flow across the MV; and the role of RV stroke volume should be considered in the genesis of PAH in MS. Normally, the flow across the MV during diastole is passive but augmented by suction effect generated by LV relaxation during early diastole and by LA contraction during late diastole. , Conceivably, in the presence of MS, the suction augmentation of diastolic flow will be reduced or ineffective. Apparently, to generate flow across the stenosed MV, the LA has to be pressurized, it is intuitive to consider that this pressurization of the LA is achieved by RV stroke volume generated during systole which in turn raises the mean pulmonary artery (PA) pressure and LA pressure and imparts potential energy to LA to achieve flow across the MV during diastole. However, over a period, reflex protective pulmonary arteriolar constriction and pulmonary arteriolar obliteration sets in, which result in further increases in pulmonary vascular resistance, PA pressure and remodeling (hypertrophy) of the RV to overcome raised pulmonary vascular resistance. PAH in MS is benign and mechanical in the beginning and develops as a compensatory mechanism to overcome resistance offered by MS; later, it progresses secondary to pulmonary arteriolar constriction and pulmonary arteriolar obliteration. However, in a given patient it is not possible to know the contribution of each of these factors in the genesis of PAH. From this discussion, it is intuitive that sustained RV performance and PA pressure is essential to overcome resistance offered by MS and increased pulmonary vascular resistance to achieve LV filling and sustained LV stroke output. Based on this hypothesis, it is apparent that clinical situations that result in decreased RV performance/decompensation would result in low cardiac output whereas situations where RV performance remains unaffected or increases in response to pathophysiological stimulation might result in increased LA pressure, pulmonary congestion, edema, but sustained cardiac output. Apparently, in patients with MS, RV performance and response to varying clinical demands and basal atrio-ventricular compliance decides the clinical features. This explains varying clinical presentation associated with similar degree of tachycardia in patients having similar degree of MS. Apparently, patients who can mount RV performance and increase or maintain PA pressure in response to pathophysiologic challenges can maintain cardiac output but are likely to develop features of pulmonary congestion and edema whereas those who develop RV decompensation and cannot sustain PA pressure develop features of low cardiac output. This is typically seen in pregnancy wherein physiological changes in cardiac function make a pregnant patient more prone to pulmonary congestion and edema. Arguably, while anesthetizing these patients, it is important to sustain RV function else the patient may develop cardiovascular decompensation. Dyspnea on exertion due to an increase in the work of breathing is the key feature of MS; the physiological activities that demand increased cardiac output such as excitement, physical activity, pregnancy, etc., increase transmitral flow which in turn increases LAP and transmitral gradient and results in increased pulmonary venous pressure, pulmonary congestion and dyspnea. Tachycardia secondary to atrial fibrillation, fever, or any other reason decreases diastolic time, LA emptying and increases LA pressure and results in aggravation of dyspnea. In a few patients with severe MS, hemoptysis occurs and is due to rupture of pulmonary and bronchial veins. Hemoptysis typically occurs before the onset of PAH and a decrease in the PA dimensions protects the distal vasculature from volume overload. Roberts WC, Perloff JK. Mitral valvular disease. A clinicopathologic survey of the conditions causing the mitral valve to function abnormally. Ann Intern Med 1972;77:939-75. Maganti K, Rigolin VH, Sarano ME, Bonow RO. Valvular heart disease: Diagnosis and management. Mayo Clin Proc 2010;85:483-500. Ramirez J, Flowers NC. Severe mitral stenosis secondary to massive calcification of the mitral annulus with unusual echocardiographic manifestations. Clin Cardiol 1980;3:284-7. Osterberger LE, Goldstein S, Khaja F, Lakier JB. Functional mitral stenosis in patients with massive mitral annular calcification. Circulation 1981;64:472-6. Muddassir SM, Pressman GS. Mitral annular calcification as a cause of mitral valve gradients. Int J Cardiol 2007;123:58-62. Rahimtoola SH, Durairaj A, Mehra A, Nuno I. Current evaluation and management of patients with mitral stenosis. Circulation 2002;106:1183-8. Braunwald E, Turi ZG. Pathophysiology of mitral valve disease. In: Ionescu MS, Cohn LH, editors. Mitral Valve Disease. London: Butterworth's; 1985. p. 3-10. Selzer A, Cohn KE. Natural history of mitral stenosis: A review. Circulation 1972;45:878-90. Moore RA, Martin DE. Anesthetic management for the treatment of valvular heart disease. In: Hensley FA, Martin DE, editors. A Practical Approach to Cardiac Anesthesia. 2 nd ed. Philadelphia, Pa: Lippincott Williams & Wilkins; 1995. p. 296-325. Schwammenthal E, Vered Z, Agranat O, Kaplinsky E, Rabinowitz B, Feinberg MS. Impact of atrioventricular compliance on pulmonary artery pressure in mitral stenosis: An exercise echocardiographic study. Circulation 2000;102:2378-84. Neema PK, Misra S, Manikandan S, Rathod RC. 2-dimensional echocardiography and M-mode Doppler of the interatrial septum for assessment of left ventricular diastolic function. J Cardiothorac Vasc Anesth 2011;25:588-9. Nishimura RA, Tajik AJ. Evaluation of diastolic filling of left ventricle in health and disease: Doppler echocardiography is the clinician's Rosetta Stone. J Am Coll Cardiol 1997;30:8-18. Choi BW, Bacharach SL, Barbour DJ, Leon MB, McCarthy KE, Bonow RO. Left ventricular systolic dysfunction diastolic filling characteristics and exercise cardiac reserve in mitral stenosis. 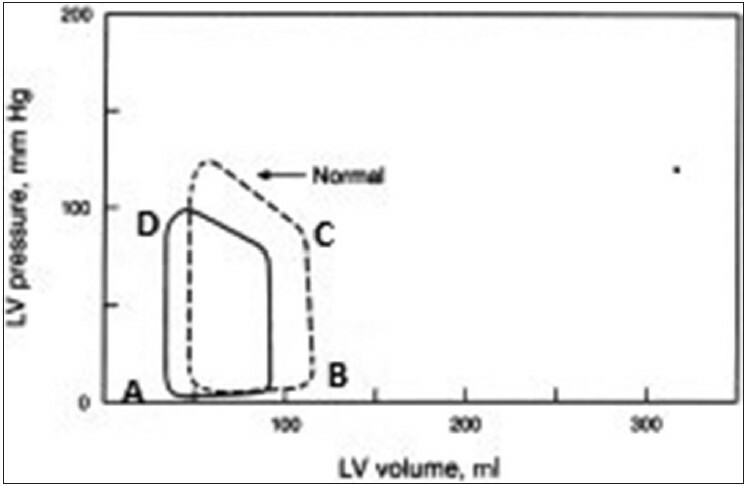 Am J Cardiol 1995;75:526-9. Popescu BA, Antonini-Canterin F, Temporelli PL, Giannuzzi P, Bosimini E, Gentile F, et al. Right ventricular functional recovery after acute myocardial infarction: Relation with left ventricular function and interventricular septum motion. GISSI-3 echo substudy. Heart 2005;91:484-8. Saleh S, Liakopoulos OJ, Buckberg GD. The septal motor of biventricular function. Eur J Cardiothorac Surg 2006;29 Suppl 1:S126-38.